I'd already traced my pattern pieces and added the seam allowance, so today I cut my muslin and sewed it up. I still need to grommet it, because without lacing it's really hard to get an accurate fit. And the photo is blurry, but you get the idea of the shape, I think. Imagine it with sleeves, and with a much more fitted bodice (there's no boning in the mock up yet) and that's the finished shape of the gown. I haven't messed around with the sizing at all yet. This is literally the pattern as it came out of the book, which was developed, as I understand it, from actual museum pieces. 6 so far for the bodice, but that's because I've had to photocopy, size up, trace pattern pieces, add seam allowance, then cut and sew. 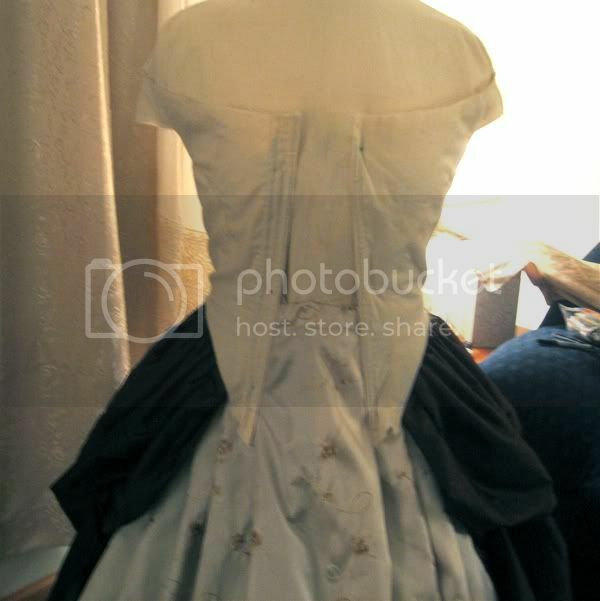 All in all, this is actually quite a quick bodice to go together, once I get the shape and sizing as I want it.